This experiment was to be a simple carousel book of just 4 spreads if possible. Maybe it still will be. The second set was given away as cards. They are taped onto some of my Easter postcards so the viewer can peek through the front scene to another picture. I cut them freehand without drawing or pattern. 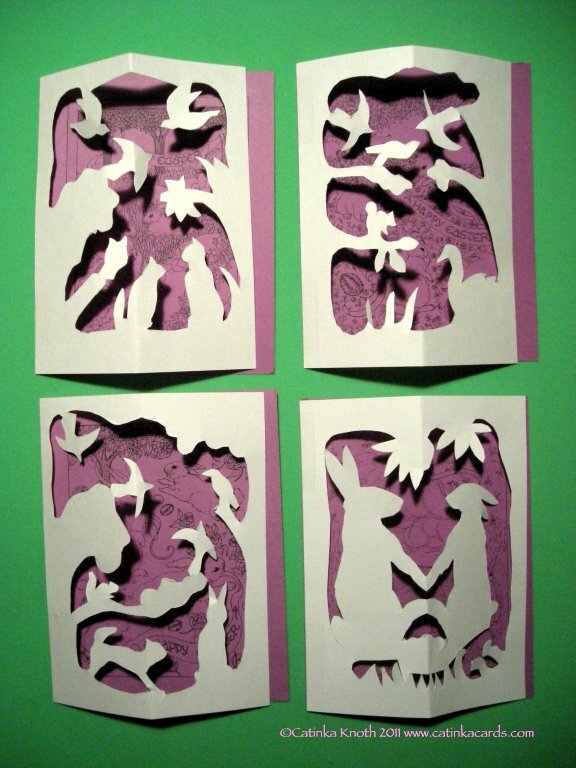 The book tells that he created freehand papercuts while telling his stories. These were then given as gifts to his dinner hosts or to the children listening. Instead of illustrations of the stories the papercuttings served as secondary story lines to help captivate the listener and provide a bit of a show! 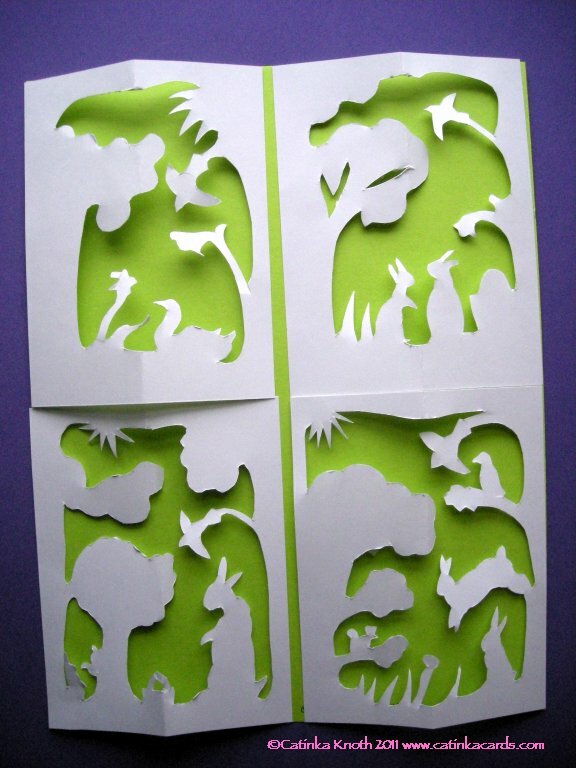 Can you imagine being able to tell a story while making up a papercut?... He made several thousand of them. Quite a few survived. The Odense Museum has more for you to see and read about H.C. Anderson. 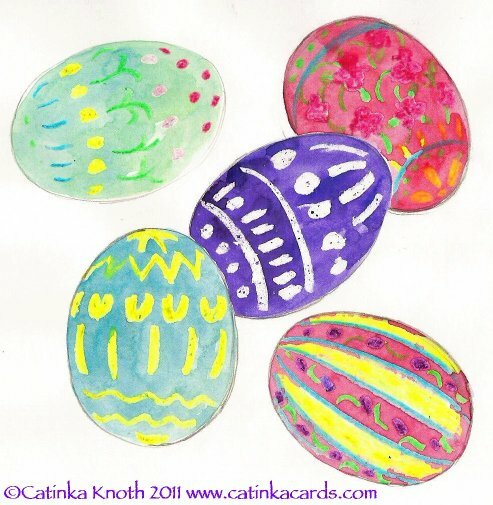 Rockland - Catinka Knoth will give a free demonstration on how to paint watercolor Easter cards, at Lincoln Street Center, on Monday, April 4th, 11 a.m., 24 Lincoln Street, downstairs in "The Messy Art Room". Attendees will see how to use colorful crayon resist techniques to paint Easter egg patterns as cards. 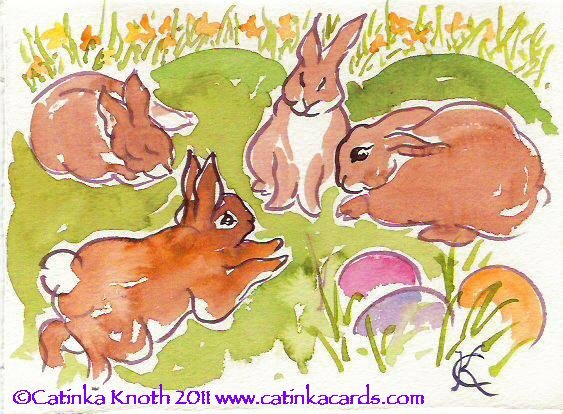 Knoth will also paint freehand rabbit scenes in watercolor. Knoth will repeat the demonstration on Monday April 11, 6pm, same location. 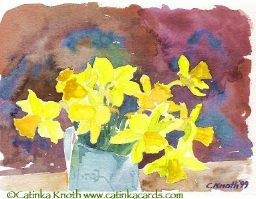 Knoth is also offering a four part watercolor workshop "April Art" , Tuesdays 10-Noon, April 5 - 26th, Messy Art Room Studio, at Lincoln Street Center, 24 Lincoln St. Each week's class is a different subject. Participants will explore themes such as daffodils and yellows, the Japanese Cherry Blossom Festival, colorful Easter egg designs, and rabbits. The weekly class fee is $25. For more information contact Knoth at 596-0069 or visit her website www.catinkacards.com. One of the cards i made at today's demo. Make up some sheets of card stock by painting random watercolor washes. Let dry while you make the papercuts. They can be as simple as a triangle tree connected to a frame. This one is a creature a bit like a deer, and is actually the cut away part of the papercut! Download my free daffodil watercolor notecard (c. 3mb pdf). Print on 8.5 x 11 paper, fold in half the short way, and in half again to make a frenchfold notecard. Happy spring writing!